I was in the shower a week or so ago (I have returned there since. Stop fretting.) I was having a lovely time. A vision of glowing cleanliness, glistening in suds. I hadn't yet put in my contact lenses, so I bent down and blindly groped around the charmingly mouldy corners of the shower, looking for the welcoming bristles of the nail brush. I began to scrub away, and then brought my hand and brush nearer to my face so I could see what I was doing. As I squinted to focus the blur in front of me, I yelped in horror. The brush was full of short, dark, wiry hairs...and now my hands were covered in them. Yes, I am 90% sure that I vigorously rubbed extraneous pubic hairs into my cuticles. I live with six gentlemen. I will never know who they originated from. And part of me thinks this is for the best. The permanent cover of the continual contact lens was like keeping the infection like tomatoes all toasty inside a greenhouse. Well, these vicious squatters then started to kick the hell out of the inside of my poor peeper and I now have a permanent scar on my cornea (which I think is pretty cool) from where it had started to melt. Yes, MELT. Nobody had ever had such a horrific experience with melting. Well, not including the Wicked Witch of The West. Eye trauma aside, those of us that are visually challenged have, for decades, been on the run from the negative stereotypes that go hand in hand with needing to wear glasses. I have always wondered why it is that glasses apparently makes for being a 'geek'. But then again I have always hung my head in my hands when about 99% of people that fall into the contemptible brand of nerd-ish territory all do seem to wear them. Severely letting my cause for looking cool in spectacles down. Is it some kind of freakish coincidence? Do all clever people have bad eyes? If so, I would like you all to know right now that I can't even see the end of my nose without my glasses. Ahem. It was the fear of the geek-branding that made me miserable about glasses as a kid. Not at first, mind. I remember when I initially had to get them actually. I was in class 3P of 'Junior School' and I thought it was a most excellent thing at the time as I had a letter to hand to Miss Pearce notifying her of my absence that afternoon because of an appointment with the optician. Little did I know that the one blissful afternoon I enjoyed avoiding P.E. would bear a heavy price of a ticket to derogatory stereotyping through into my adolescence. "You are clever, enjoy it while it lasts. You are startlingly tall compared to your peers; in a few years you will be wearing heels hoping for more. In a couple of years you will sprout an enormous chest a lot earlier than all the other girls around you. It is not a curse. It is the beginning of a very beautiful relationship. Fifteen years in the future you will be using them bad boys to get men to do what you want and get drinks before others. So don't panic." So jump forward fifteen years and now, very confusingly, apparently it's exceptionally cool to be wearing glasses? So much so in fact that I now get infuriated by berks who wear pretend ones. They weren't there at the beginning, when times were tough, when the insult blitz was a-raging. And now they want to jump on the bandwagon? Pah! The fickle folly of youth. I have to say that now I am a real person that has shed the skin of insecurity like a super-chic snake, I thoroughly love my glasses. I suppose they fit in to the recent trend of 'geek chic'. Golly. Who would have ever thought there could ever be such a thing. So yes, glasses are something to not shy away from. They're endearing. I find certain chaps look amazingly hot in them. Perhaps to a point where its a bit of a fetish...? They make you look clever even if you're not. And you can feign sexiness through the 'mucky secretary' look. 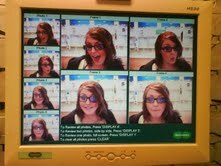 And best of all, you get to play with those camera machines in Specsavers.